On the hunt for the best foosball table? If you are looking for a great table for your game room or just a tabletop model for your kitchen, we have them all. So if you are looking for the best foosball table around, we’ve done all the research and reviewing for you. We searched the internet for the very best tables, looking for the perfect table. We compiled all our favs into this top ten list. We used a few stats to help find the best. Here is the list of some of those things to look for while you’re shopping. Number of Players - How many players on each of the tables? Standard tables usually have 22 or 26 players; we’ll let you know how many players are on each table. Scoring System - Does it have a scoring system? Some will be manual and some will be electronic; we’ll give you more information in each of the table reviews. Playfield Length - The length of the table is really important to make sure you have enough space. You’ll need an extra 2 feet of space on the table ends. Players Material - What are the players made of? The material they are made of can affect durability. Most will be made from either metal, ABS, or plastic. Playing Field Material/PFM - What is the playing field made of? The material that the playing field is made from can affect how durable it is in the long term. Most will as be painted. Dimensions - You’ll need about 7 by 8 feet of space for a standard foosball size. If you don’t have that much space, you’ll need a smaller table. Now that we’re done with the stats, we’re just about ready for those foosball table reviews! We loved all ten of these foosball tables, but there were two in particular that really stood out from the pack. The first is our Top Pick, which was our favorite of all ten. The second is our Budget Pick; it’s an awesome foosball table for those on a budget. If you’re in a hurry, check out those two first! Let’s move on now to all those awesome reviews! 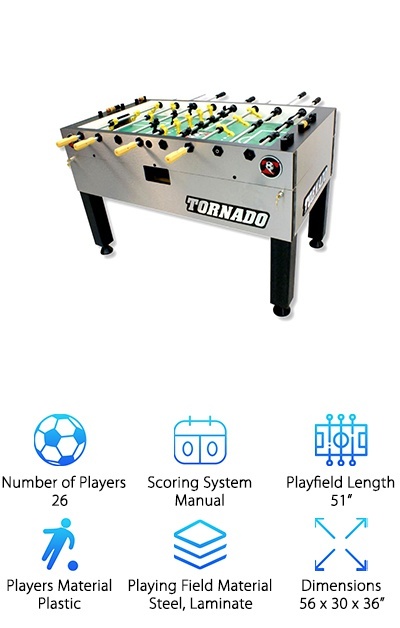 Our Top Pick is the Tornado Tournament Foosball Table! 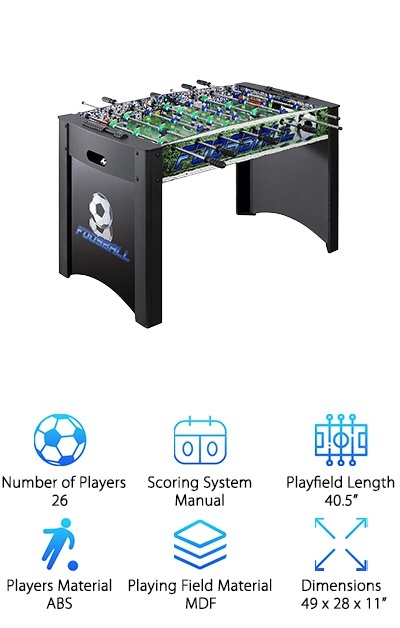 This foosball table is full-sized at 56-inch with a stainless steel laminate field. The manual scoring system and the men are all made of durable plastics. This foosball table is ITSF-certified. It is quick and easy to put together. We love the competition bearings and the increased cross sections that make for better overall gameplay. This table is built in the USA, and it is always ready for a great time. We love everything about this table; it is made from quality parts and materials that make for a great, long-lasting table that is fun for newbies and pros alike. This quality table is not cheap, but it is worth for hours and hours of fun with your family and friends. 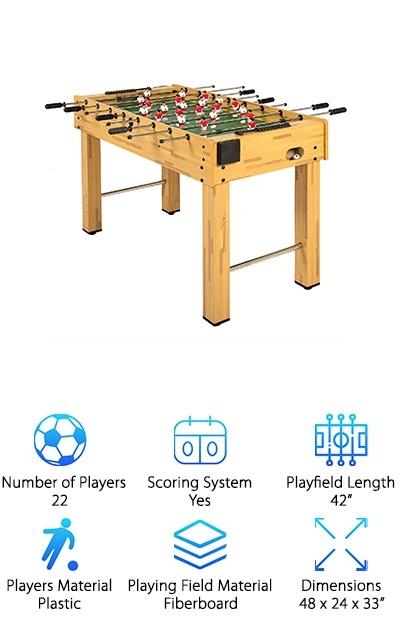 If you’re looking for the best foosball table for the money, we think that the Sport Squad Foosball Table fits the bill! We also think that it’s the best tabletop foosball table around too! We love tabletop models because they save space and money. If you don’t have a lot of room for a full foosball table, this is a great thing to consider. It is smaller than regulation size, but it still big enough for everyone in your family to have fun. The rods are chrome-plated steel that are tipped in rubber handles for the best grip. This smaller table only comes with 18 men, but they are made of durable plastic. The fiberboard field is flat, but the ball almost never gets caught in the corners. Looking for a more versatile table? 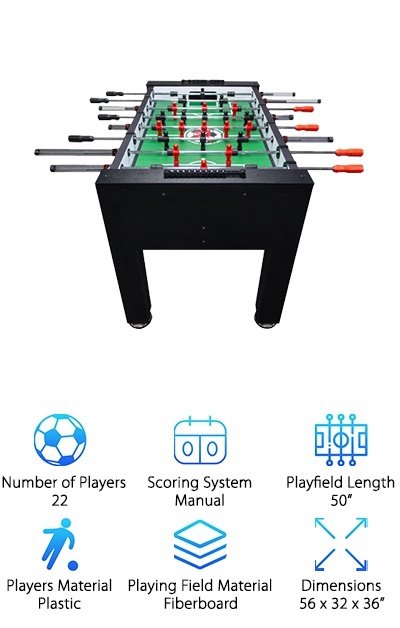 This 3-in-1 table is a small pool table, an air hockey table, and a foosball table all in one. It comes with everything you need to get started, like sticks, balls, and more. Though the tables aren't full-sized, it packs tons of fun in a small space. Both kids and adults will have a great time on this table. The field and ice of the foosball and hockey table are made of durable MDF. The base box has adjustable legs to make sure the playing field is always level. The foosball table has a full number of players at 26 and all them are made of hearty plastic. We love this table for its versatility, space-saving, and for its inexpensive price tag! Kick is one of the best foosball table brands in the world. They really love foosball, and they make quality products that are simple, durable, and fun. The men are counterbalanced in the classic, one white and one yellow team; there can be three goalies or one in the last row, depending on the skill level of the players. The legs and cabinet are both of a solid black, making it look both classic and attractive. The bearings are premium, the ball returns are on both sides of the table, and the handles are no-slip and chrome-plated. It even has two optional cupholders that you can attach to both sides of the table for maximum fun. And our favorite part of all Kick foosball tables is their warranties that covers your new purchase for life. Want a more traditional, wooden foosball table? 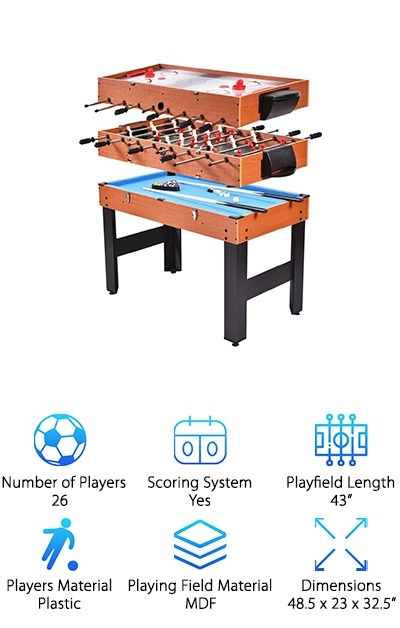 The Best Choice Competition Size is made from light wood panels, features painted, uniformed men, and a traditional-looking field for a truly classic foosball look. Constructed of MDF, this durable table has chrome-plated steel rods with comfortable grips. This table’s field is as frictionless as possible and is ready for play with both 11-man teams. This table features cup holders at either end of the table for each player. It comes with two balls along with everything you need to put together this awesomely classic table. 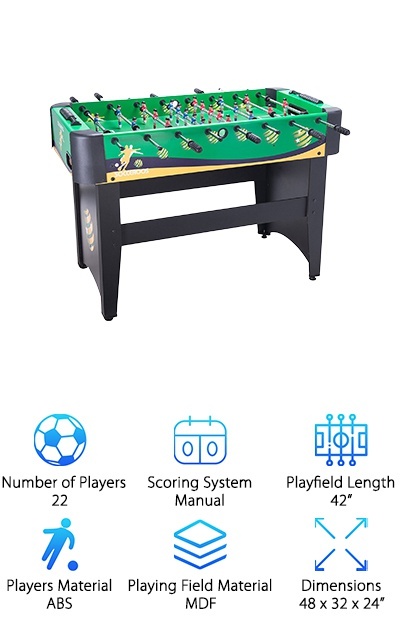 It is not a full-sized foosball table, but you probably won’t miss those few inches when you are having a blast with your friends on the Best Choice Competition Size Foosball Table. We love it, and we’re pretty sure you’ll love it too! Want a classic, soccer look for your foosball table? The Pinty Foosball Table is a green-and-black cabinet that is a great addition to any playroom or basement. The table is about 48 inches long, which means it just a little smaller than regulation. 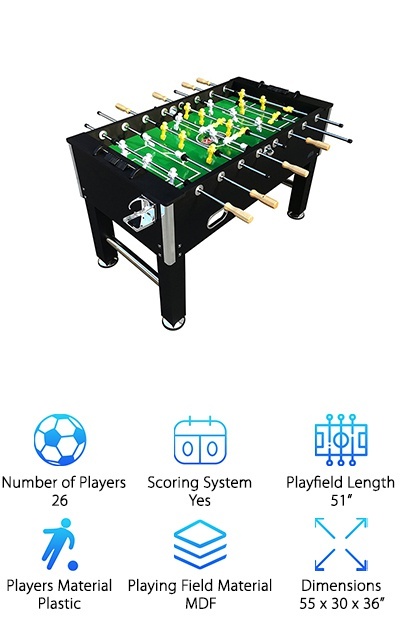 The Pinty Foosball Table has rods constructed of durable and smooth steel rods tipped in super-grippy handles. The legs are reinforced for stability. The robot-style men are made from a strong ABS. This table has a manual scoring system that makes keeping score fun and simple. It’s easy to put together. And the best part? The men are painted with hair, faces, and uniforms to give your team the look of more realistic people. We really love the look of this table and all its accessories! The Warrior Professional Foosball Table manufacturer states that this table is “dollar for dollar the best foosball table.” And we tend to agree! This table is inexpensive, well-put-together, and has some great features. The cabinet is wood, and it is put together quickly with a single tool. This table is designed with families in mind! The play is advanced for all the adults in the family; the counterbalanced men and advanced playing field are great for the more advanced players. And this table has some great features for the kids, too! It has a unique rod guard system that helps to prevent injury to both the players and the spectators! Not to mention the 5-foot wide base that provides additional stability. So it’s perfect for any family game room! The Hathaway Playoff Soccer Table looks like a stadium full of fans cheering for your foosball wins! This is a large table, but it is not quite regulation size. It’s really well-built and durable; the thick, L-shaped legs help support all 60 pounds of this table, keeping it stable. The playing field is made of thick, durable fiberboard. There are 13 players per team, giving you a total of 26, ABS players that are have uniforms and are ready to play. They are attached to chrome-plated steel rods that are tipped in easy-to-grip rubber. And the best part of this is truly the graphics. Between the cool, grass graphics on the playing field and the amazing uniformed men, this is a truly cool looking table! Not to mention that this table is covered under a pretty comprehensive 90-day warranty! If you thought the 3-in-1 table is cool, you’re going to love this one! 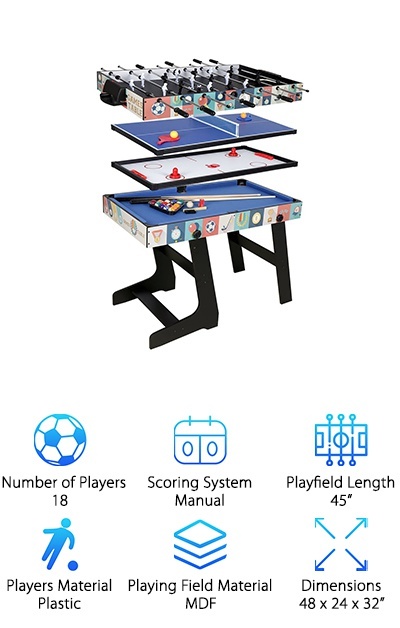 The Funmall Multi-Function 4-in-1 Table has four great games: air hockey, pool, ping pong, and foosball. The four games stack on top of each other to save space while still giving you access to all these fun games. The tabletops are all made from quality fiberboard. It comes with everything you’ll need to get started, including billiard balls, cue sticks, brush, chalk, soccer balls, rackets, net, tennis balls, and the strikers and pucks for hockey. 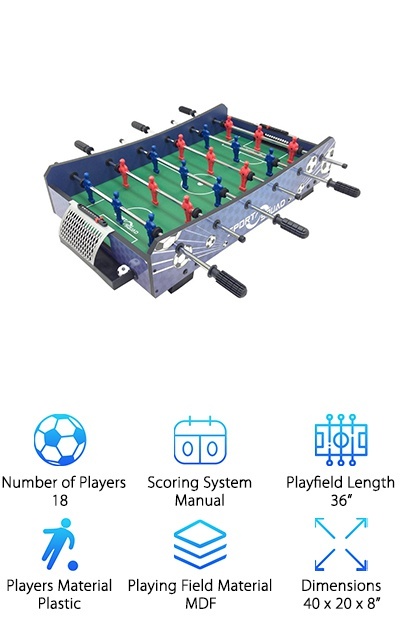 Although the foosball table isn’t full-sized and only has 18 men, it certainly has full-sized fun! So if you’re looking for a 4-in-1 space-saving game table, this one is pretty near perfect. We love the Funmall Multi-Function 4-in-1 Table, and we’re pretty sure you will too! EA is a well-known name in sports video games and sports casting, but did you know they also make foosball tables? 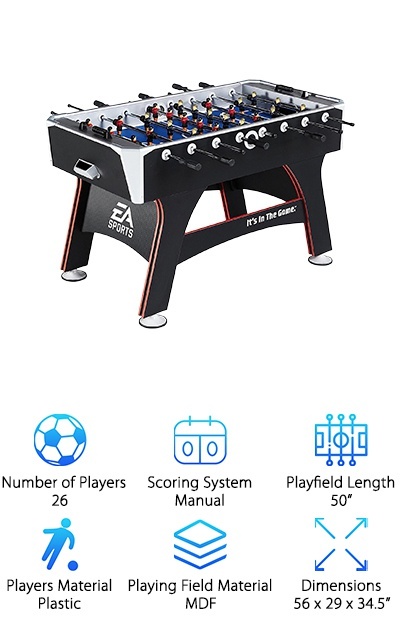 The EA Sports Foosball Table is a great table made by a great company. It weighs in at about 92 pounds and is a full-sized, regulation size table. The rods are chrome-plated and feature 26, hand-painted players. The scoring system in a simple, bead system that’s easy to use. The legs are thick with crossbeams to help improve stability. They also have five-inch levelers on the bottom to help keep the playing field level. The field is blue MDF, the cabinet is black with white accents, and the legs feature red stripes that make this table look unique and beautiful. This table is a really good looking, and it would light up almost any game room or basement!